Adirondack Trailways Adds North Creek as a Stop North Creek, N.Y. - Two new bus services will increase accessibility to and around the Gore Mountain Region this winter season! Gore Mountain has partnered with Adirondack Trailways to offer packages that combine lift tickets with round-trip transportation from both New York City and Ridgewood, NJ to North Creek. "For the first time, skiers and riders in New York City can purchase Gore Mountain lift tickets along with convenient bus service to North Creek. Two-day lift tickets packaged with transportation is priced under $200," commented Emily Stanton, Gore Mountain Marketing Manager. To purchase a package, call Trailways at (800) 858-8555. Bus service can be purchased with a 1-day adult lift ticket for $154, with a 2-day lift ticket for $196, and with a 3-day lift ticket for $232. Lodging should be reserved separately with area properties who provide shuttle service to Gore, which include The Copperfield Inn, the Alpine Lodge, or the Summit at Gore Mountain in North Creek. Trailways guests, as well as all visitors and residents of the region, can rely on regular shuttle service between Main Street North Creek, the Ski Bowl, and the Gore Mountain Base Area. 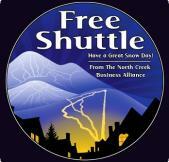 The North Creek Business Alliance coordinated the new shuttle service, which is available 8:00am-4:30pm every Saturday, Sunday, and holiday period day through March 15. The comfortable 14-passenger shuttle will loop between the Copperfield Inn, the Alpine Lodge and the Gore Mountain base area throughout the morning hours, adding the North Creek Ski Bowl as a stop starting at 11am. When snow cover allows, Gore Mountain will regularly open its "Pipeline Trail" that connects Gore Mountain to the North Creek Ski Bowl, knowing guests have shuttle transportation back to the Gore Base Area. The Business Alliance shuttle is funded through a combination of county and town bed tax funds, cooperative display advertising on its interior by area businesses, and business contributions. The Trailways packages and the new North Creek Business Alliance Shuttle are both exciting developments, as Gore Mountain continues to prepare for its 2010/2011 Interconnect with the Historic North Creek Ski Bowl. The interconnect will increase Gore Mountain&apos;s vertical drop to 2500&apos;, the sixth greatest in the Eastern United States, and will bring the mountain and its surrounding region closer together in both location and improved destination appeal. For complete details about Adirondack Trailways and the North Creek shuttle, visit www.GoreMountain.com.